The Peterborough Jiu Jitsu Club was established in 1988, initially located at the YMCA until moving to the Peterborough Multi-Sport Club in 2019. The club runs year-round. New members, including complete beginners,are welcome at any time, and the first trial class is free. Join us on Facebook for up to date notices and information. Mike McGuire - started studying jiu jitsu at the Peterborough YMCA in 2007 under the instruction of Andy Dobie. In 2012, he happily took on the role of Assistant Instructor at the newly formed YMCA youth club, and in 2015 he founded and became lead instructor for the youth program at the Peterborough Jiu Jitsu Club. Mike also trains regularly at the adult club. Andy Dobie - began his study of jiu jitsu in 1985 in Plymouth, England, with The Jiu Jitsu Foundation, and has been teaching since 1988. 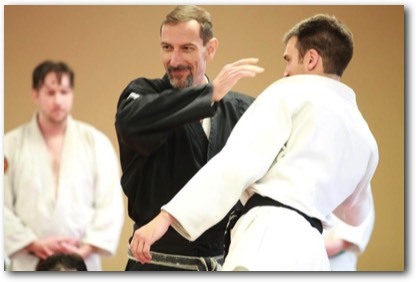 In 1993 he moved to Peterborough, Ontario, Canada and founded Jitsu Canada. Andy is the president and head instructor of Jitsu Canada.